As spring is trying to overcome its shyness in New York, I head south to Tennessee to celebrate the birthday of brother James. He has recently relocated to the Nashville area. We come from a family of history buffs and spend some time during the visit learning about the many statesmen and politicians who emerged from the Volunteer State. 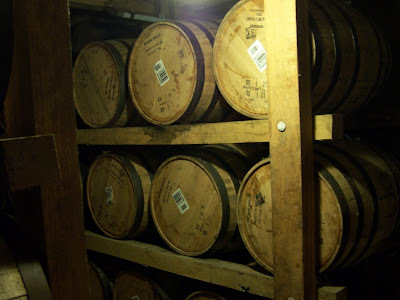 After that, we decide to do some first hand research on the really important historical figure of the region – the inventor of Tennessee Sour Mash Whiskey. It is a Sunday, and the parking lots for the local houses of worship in suburban Nashville are overflowing. We, however, are on our way to a distillery, which we will shortly learn actually has an ecclesiastical connection. Perhaps there is a chance we won’t go straight to hell. As we leave the populace behind us, the strip malls become rolling green hills, dotted with cattle. We note a few tractors and some splashes of yellow forsythia. There is a Piggly Wiggly Store, and a number of gracious antebellum homes with log cabins out back. An establishment called Antiques & Uniques is offering concrete lawn art for sale. The selection includes the Blessed Virgin, Saint Francis and a Confederate Soldier. It’s all part of the charm of Middle Tennessee. Some 75 miles south of Nashville, we arrive in the village of Lynchburg, a slumbering hollow with a population of 361. It is also home to the Jack Daniel's Distillery, where they’ve been making Tennessee Whiskey the same way since the 1860s. Our tour guide is Brian, a lanky rascal with white hair, a leathery complexion and a whiskey-mellowed voice. 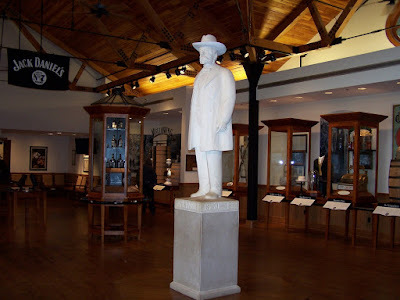 He invites us to follow him, and take it “slow and easy, the Jack Daniel’s way.” Brian takes us to the original office of Jack Daniel, located on the grounds, and now listed on the National Historic Register. We are told that Jack learned the process of making whiskey from a Lutheran minister, something they never bothered to mention to me in confirmation class. When the minister finally found religion, Jack took possession of the still and the rest is history. To say Jack Daniel’s was inspired by the divine might be pushing it a bit, but it makes James and me feel a little less like a couple of heathens, spending Sunday afternoon at the distillery. 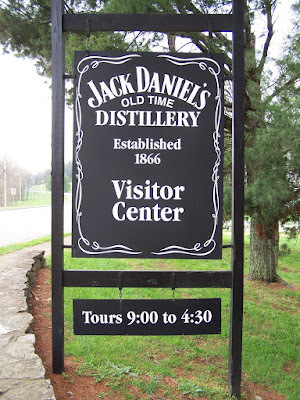 Since Lynchburg is located in a “dry” county, you can’t buy Jack Daniel’s Old No. 7 brand there, and in fact, we actually end the tour with a refreshing glass of lemonade. No sense getting arrested so far from home. 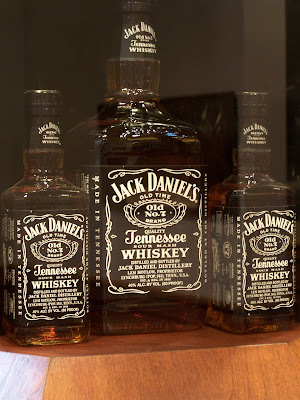 So, feeling a little parched, I purchase a bottle when I return to New York and recreate those Tipsy Fudge Cakes, soaked with Jack Daniel’s, that are available for purchase in every souvenir store in Tennessee. 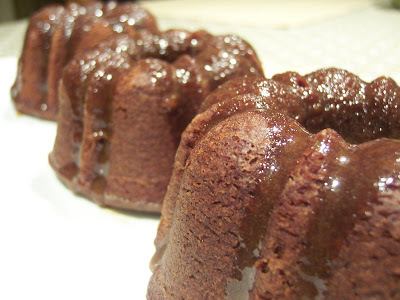 Using the recipe found here, I bake up a half-a-dozen chocolate mini-bundt cakes (which only need to bake for 20-25 minutes) glazed with caramel whiskey sauce. With deep, rich flavors of dark chocolate, coffee and mellow whiskey, these “Little Jackie Ds” are slow and easy, just the way Gentleman Jack would have liked it. Thanks for the tour, T.W. I'm laughing to myself seeing that you took the opportunity to squeeze in a food/beverage-related side trip during the birthday visit to your brother's new town. I probably would have done that too. Tennessee is an interesting state with lots of friendly people. Way to pay tribute to history and pay respect to your surroundings. Way to..*hic* make a serious serious of loaded cakes! Your mini cakes look so beautiful, T.W.! And that is an interesting tour. Sounds like you had a wonderful trip. Looks like it's been updated. 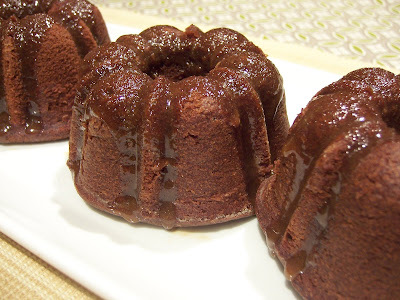 Mmm...The caramel whiskey glaze was a sweet touch. I'm definitely not a whiskey drinker, but after reading your post I'll put that tour on my agenda for my next visit to Tennessee. I've passed through that part of the country a few times, but never spent enough time there. Lucky you, to have a brother in Nashville! I love minis - and I'm sure they tasted awesome with the whisky in it and a caramel glaze to boot. I've always thought mini bundt cakes were the cutest! Hi Kathy - the first thing I do when I get to a new location is look up the food and beverage related attractions! Thanks, Patricia! They were gobbled up so quickly! Louise, I ended up quite fond of that caramel glaze and will use it again -- brown sugar, cream, butter, and a touch of whiskey. Veron - I think we could pair these Little Jackie D's up with some of your mini confections and have a great party! 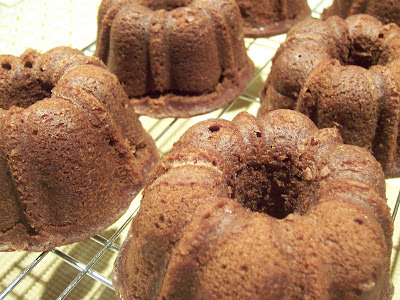 I am obsessed with bundt cake - those mini bundts are just awesome! Maryann - It's the best kind of research you can do! Valentina - Apparently, it's like no other tour in the world! Hi Susan - my declutterer tried to get me to donate my mini-bundt pan. I wanted to prove that I could put them to good use, so now they're back in the baking closet. You should go back and buy those! Enjoyed all the info. Have visited this place years ago and have forgotten so much about it-you are inspiring me to find my little bundt pans!